The purpose of this review is to take a look at one of the top MC coins in crypto and analyze its price movement. Currently, the downtrend for $ADA, which has been in place since approx. 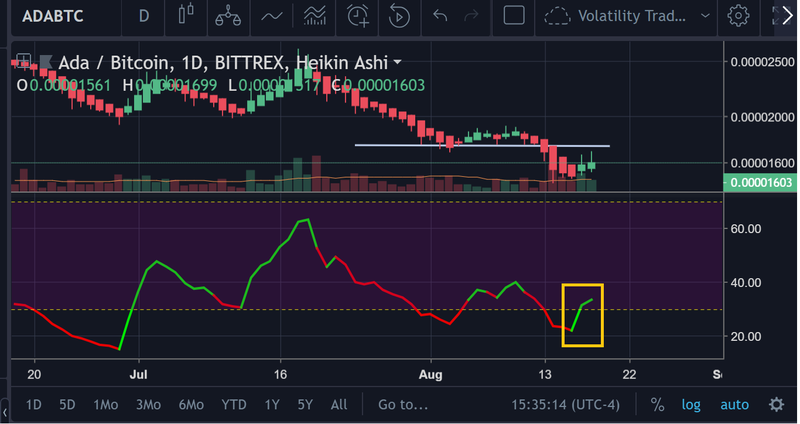 July 22nd, 2018 appears to still be holding. 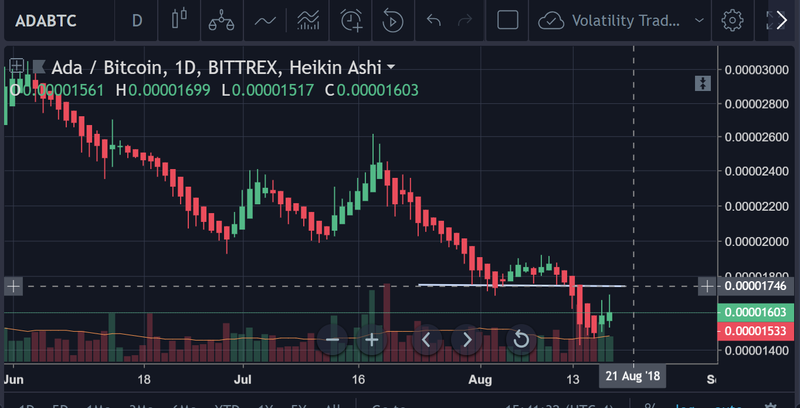 However, there is a hefty and well-tested support point that is just under where the price is as well, which sits at approximately 1476 sats. That’s about a 4.6% drop. 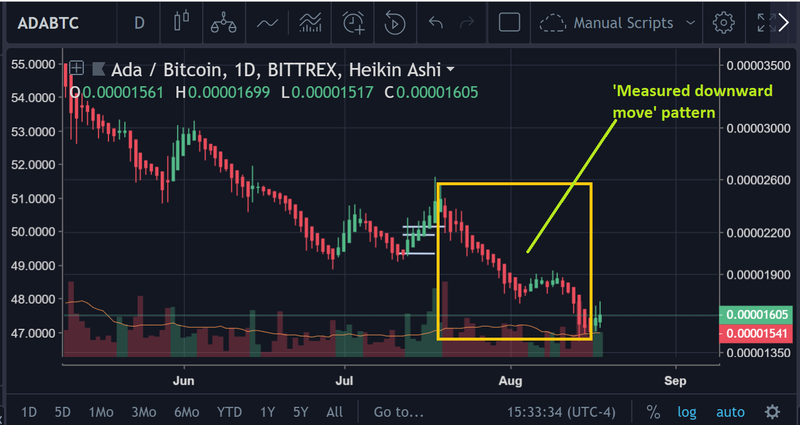 Common logic in trading says that the following picture is probably the most likely scenario for $ADA/BTC in the short-term. The potential bounce from the support point shown above is a cool +10.25%. Whenever volatility increases, bigger moves in the direction that the price is currently headed are to be expected. This could be a tip off that a bigger move for $ADA is impending. Measured Move Downward (Bearish Pattern), which occurred prior to the last two candles. Next few moves will determine what pattern we can read directly on the chart. My indicator is signaling ‘buy’ on the RSI + the RSI is out on a clean break from the oversold territory. However, it has not been out for a very long time, so it is liable to crawl back downward to the oversold region if the price folds up. A short on $ADA from where it is at this current moment in time on the $BTC chart (which is your only option if you’re using BitMex), could be a bit risky. A slight turndown as the market consolidates before making a race at the target set by that downtrend resistance seems plausible. There’s a 1:2 R/R, which is a little lower than what one would desire out of a trade (ideally, we’re looking for 1:3) — but it’ll do. Small gamble here. Nothing crazy.